All materials are provided and no previous experience is needed. Just bring yourself – – and a friend! Create an elegant hand-made mask ideal for Mardi Gras celebrations. Using paper sculpture and watercolors, with applied decorations, participants learn paper sculpture techniques and create a beautiful mask of their own unique design. Instructor: Sarah Lovett General: $40 Members: $35. December 1st between 4:30 and 7:30pm. 6495 NE 74TH Street, and a mile long trail beginning at the Redmond City Hall Redmond. Come join in the Community where everyone is an Artist! 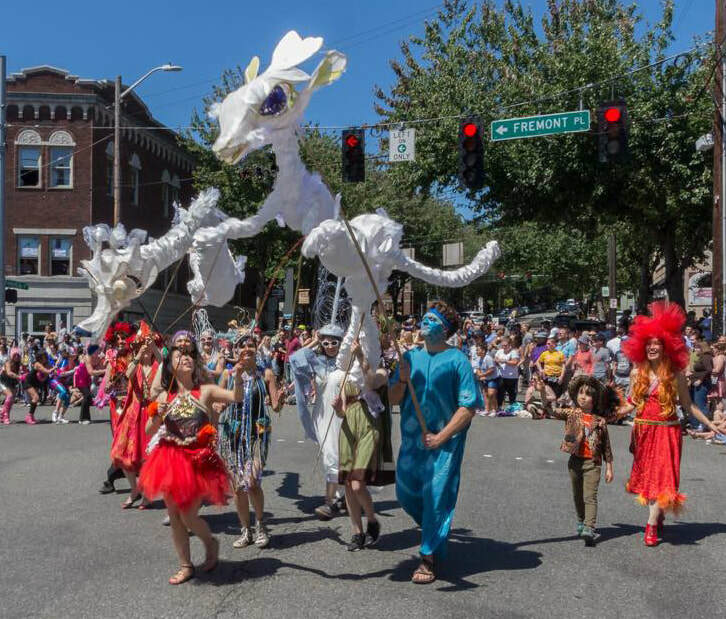 30th Annual Community Fremont Solstice Art parade continues. This year the open house for Artists awarded McKay grants to build floats and puppets will take place on Saturday May 19th 1:00-5:00pm. Please join me for this parade build kick off event. I will be making two new puppets for the parade and your support is welcomed! Luminata Sept 22, 2018, Greenlake Aquatheatre, 7:00pm. 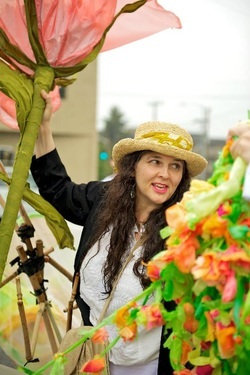 On Saturday May 19th we will be holding an Parade Open House and Artist Reception to celebrate the 2018 McKay Grant Artists and all of the other participants who bring the Fremont Solstice Parade to life! We would greatly appreciate your participation in this community event. Each artist will have a display of images or written materials about their projects. This event is part of our Parade Open House. It will be from 1 - 5 pm at the Powerhouse, 3940 Fremont Ave. N. Everyone is welcome. Dogody Puppet at winter feast, Solstice 2017. Look out San Francisco . . . Dogody's new home at Giant Puppets Save the World, with Toni Mikulka. 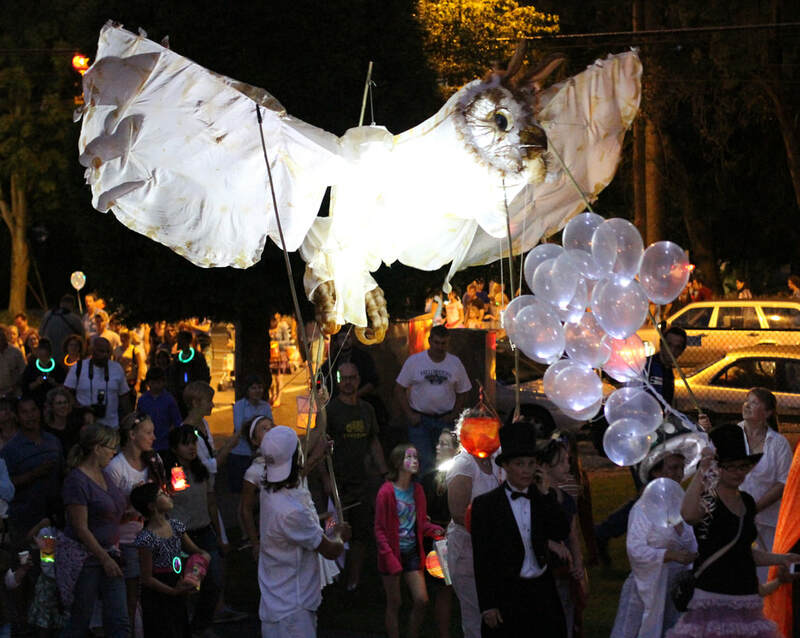 Giant Owl Puppet Performance - Babylon Death Party at Fred Animal Refuge for Capitol Hill Art Walk. Featuring a performance by Kook Teflon, & art installations. Make a sweet lantern and bring it to the Greenlake Aqua-theatre for a celebration of the last rays summer and the coming season. I will be working with volunteers and the Fremont Arts Council- at the Powerhouse Studio to make individual lanterns to carry in the parade. September 14th and 15th Thursday, Friday - 6-9pm, and on September 16th Saturday- 1-5. - meet us at -3940 Fremont Ave N. Seattle WA. Giant Owl Puppet Performance at the 10th anniversary of Arts-A-Gow Burien. September 9th, 2017. 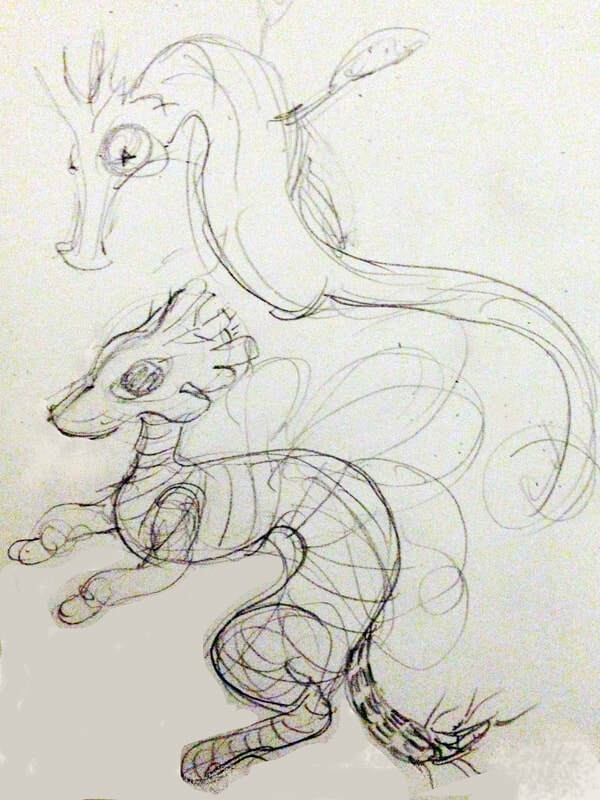 Organized By Zia Sunseri- the Seahorse luminary. Visitation - Circular garden of moss, with crystals, fountain & fairies. with Toni Mikulka and Sarah Lovett. Fremont Arts Council Booth: Giant Life Tree Deva Puppet-Build.